Nominations for branch officers must be in by noon on Wednesday 15 January and motions or rule changes must be in by noon on Friday 17 January. 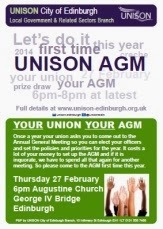 The AGM is on Thursday 27 February, 6pm at the Augustine Church, George IV Bridge Edinburgh. Click here for a poster for your workplace.